Leo the GEO-desic-Dome in Oh, No! Not that story! 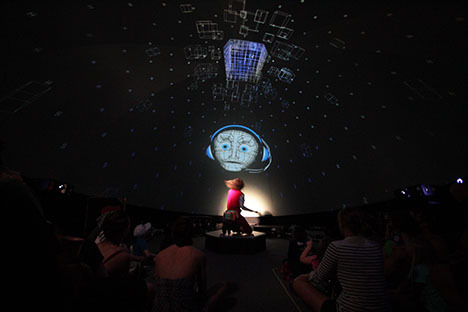 Leo the GEO-desic-Dome, bursting with technological magic, and his friend The Storyteller are eager to spin some tales. Together they team up to help Pinky, one of the Three Little Pigs, get back to his brick house. But they end up in all the wrong stories. Will they find their way back to Pinky’s home? Mixing hand puppets, digital puppets, live actors, movies, video games, and interactive visuals, lights and sound, this show gets the kids out of their seats and moving in order to help set the story straight. Premiered at The SPARK! Fesitval of Creativity at Mesa Center for the Arts. Commisioned to perform twenty-five shows, five shows a day, over the five day festival. All Ages. Available for Booking. The box world was created and rendered in real-time in Touch Designer. Connecting the physical world and the digital world. Combining ancient forms of storytelling such as theatre, spoken word, and puppetry with modern forms of narrative such as cinema, gaming, human computer interaction, etc. A story to appeal to a broad range of ages – something that grandparents and three year olds could all enjoy. 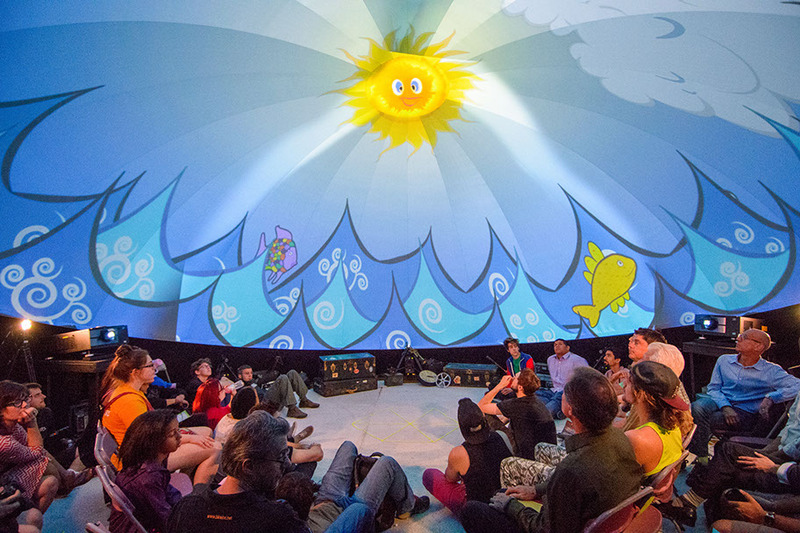 30' diameter, touring, projection dome. Custom built PC media server running multiple instances of Touch Designer for show control and real-time warping and blending. 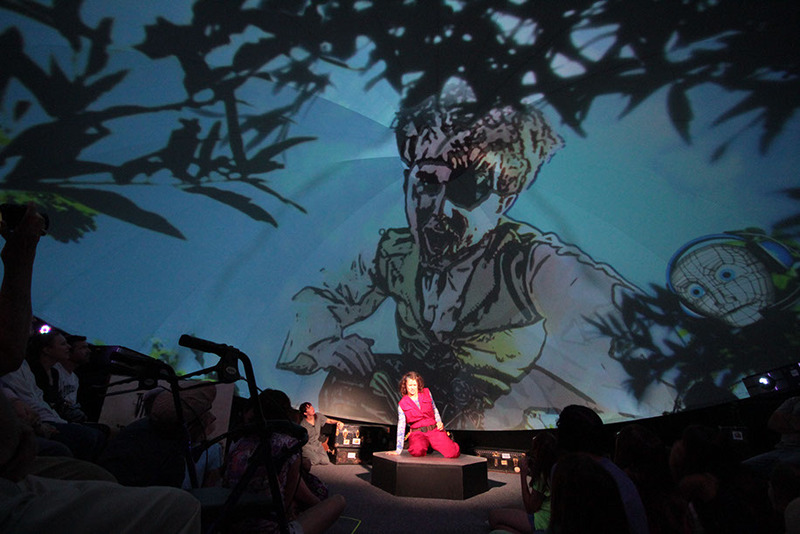 Fully integrated sound and lighting that were responsive to performers, audience and visuals. Multiple real-time, digital puppets controlled via facial recognition and wii-Motes. Software: Touch Designer, Isadora, Max MSP, QLab, Syphon, Faceshift, Black Syphon, Black Magic, Final Cut Pro, Premeire, 3D Studio Max, After Effects, Photoshop, Illustrator, OSCelator. 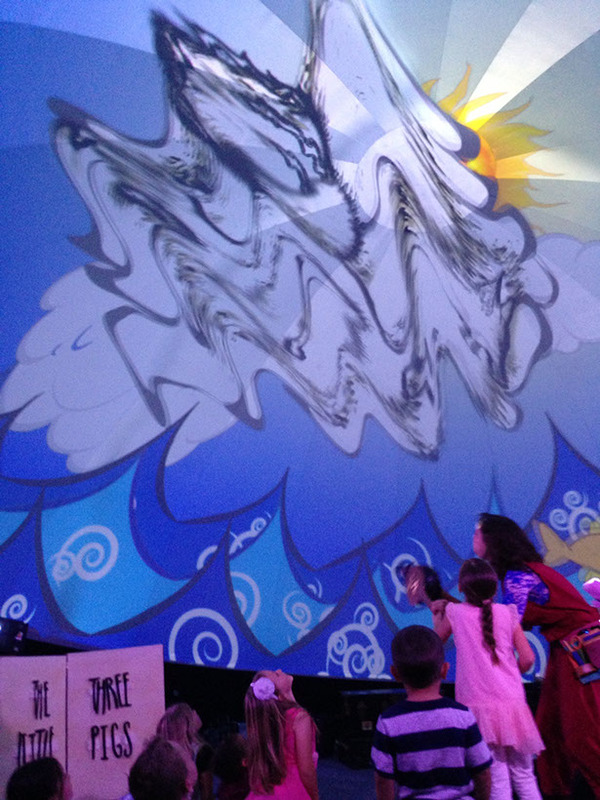 Each element (waves, fish, sun, background) was created in Illustrator and animated in real time in Touch Designer. The video of the Giant was shot on a Cannon 7D, edited in FCP and cartoon effects rendered in After Effects. Leo, the Robot is a real-time, live feed via another computer running Faceshift, a facial recognition software that allows a performer to control the digital avitor. 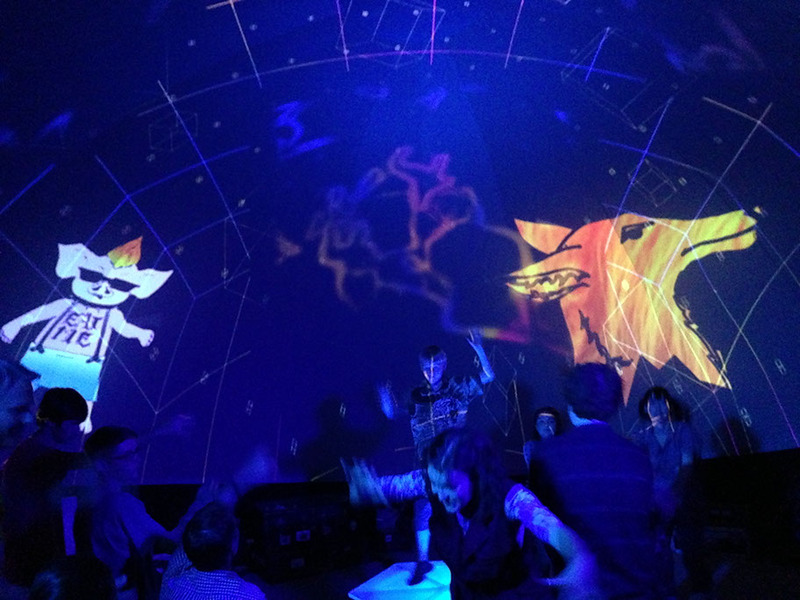 The Pig and the Wolf were created in Photoshop, animated in After Effects and live performers controlled the digital avitors via wii-Motes running in Isadora with live-feeds to the media server. 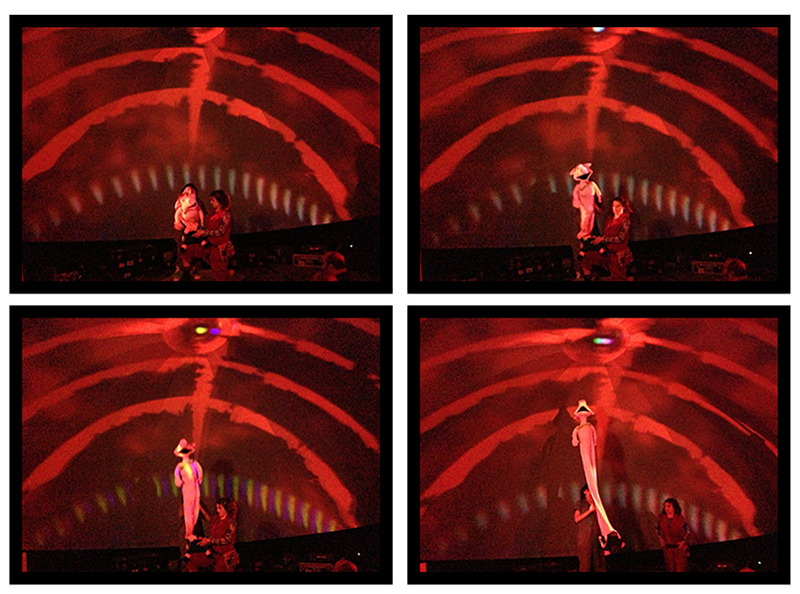 A live-feed video camera captured the audience and real time effects were applied in Touch Designer. The audience blew the cloud coyote apart. Composite of Pinky the puppet expanding. Humans tell stories. How we tell them changes.